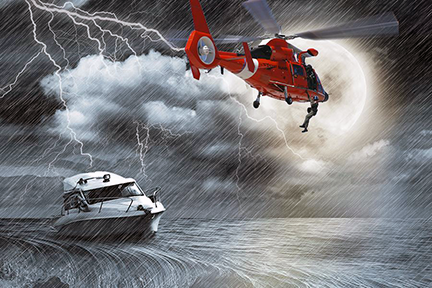 Thales Alenia Space is offering what the firm refers to as a breakthrough technology for Search & Rescue satellite solutions — the solution is named MEOLUT NEXT and is to be deployed within the scope of the global COSPAS/SARSAT system. 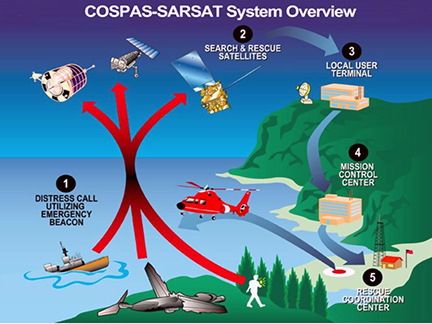 COSPAS/SARSAT is an intergovernmental organization founded by Canada, the United States, Russia and France. In operation since 1985, it provides a free global Search and Rescue service, using the infrastructures from 43 countries worldwide. French space agency CNES is the official French representative for this organization. Today, some 500,000 ships and 150,000 aircraft are equipped with COSPAS/SARSAT distress beacons, allowing them to use this service. The service has saved more than 37,000 lives since the outset. The beacon on a plane or ship is triggered, manually or automatically, and transmits a distress signal at a frequency of 406 MHz. This signal is picked up by surveillance satellites, which re-transmit it to a Local User Terminal (LUT). This terminal processes the signal, calculates the position of the transmitting beacon, and sends this information to the Mission Control Center (MCC). The MCC is in charge of filtering out false alerts, and contacting the most appropriate Rescue Coordination Center (RCC), to save the persons in danger. Until now, this system has called on secondary payloads on observation satellites in both LEOSAR and GEOSAR satellites, which will be reaching end-of-life towards 2020. Satellites in MEOSAR, with secondary payloads mounted on GPS, Galileo and Glonass positioning system satellites, will then take over this task, improving performance, precision and responsiveness. Due to the large number of satellites visible to a given beacon (up to 30), the MEOSAR service can indicate the position of an endangered person in less than 10 minutes (versus two hours for the LEO and GEO generations). Furthermore, the position-determination accuracy improves to just 200 meters, versus 5 kilometers previously. Another major advantage is that moving beacons (typically in aircraft) can be detected, which was not the case previously. MEOSAR services will start operating by the end of 2018 and will be able to detect the locations of aircraft in trouble during their flight. Thales Alenia Space's MEOLUT NEXT solution, with two small antennas located in less than 10 square meters, tracks as many as 30 satellites. Thales Alenia Space already contributes to the COSPAS/SARSAT system as exclusive supplier of digital signal processors (DSP) on LEO satellites since the 1990s. Today, Thales Alenia Space is offering a brand-new solution concerning the Local User Terminals (LUT). These terminals are in charge of processing the signals received from the satellites and calculating the position of the beacon, then sending it to the Mission Control Center. The principle of Thales Alenia Space's solution is to use two small active antennas, each comprising 64 patches. These antennas are fitted with a high-performance RF (radio frequency) unit, for upstream digitizing of the signal, followed by a highly innovative algorithmic processing method. Conventional MEOLUT systems, each fitted with six large parabolic antennas in an area about the size of a football field (or pitch…), are capable of tracking signals from six satellites (one per antenna). Thales Alenia Space's MEOLUT NEXT solution, with its two small antennas located in less than 10 square meters, tracks up to 30 satellites, thereby significantly enhancing the distress beacon detection rate, while also expanding the coverage zone. Furthermore, since there are no mechanical components in these antennas, maintenance costs are the lowest on the market. Initiated with support from French space agency CNES, this project was first validated from the technical standpoint and now allows Thales Alenia Space to offer a production version. The MEOLUT NEXT solution from Thales Alenia Space boosts both precision and performance, and is easier to deploy and maintain, meaning that it will undoubtedly improve the COSPAS/SARSAT global system's performance. In a related event, the nation of Togo and Thales Alenia Space announced today that they have signed a contract for a ground station to be installed in Lomé, Togo, to be used for the search and rescue (SAR) of persons in distress, mainly using the Galileo satellite positioning system. Based on Thales Alenia Space’s MEOLUT Next* (Medium Orbit Local User Terminal), the latest-generation MEOSAR (Medium Orbit Search and Rescue) technology, this system will enable the instantaneous location, with unprecedented accuracy, of a distress call issued by a beacon operating through the COSPAS-SARSAT ** system. The fully integrated ground station comprises a compact, high-tech beam-shaping antenna (capable of taking maximum advantage of Galileo’s SAR service), a Mission Control Center (MCC) dedicated to managing and distributing alerts, and a Rescue Coordination Center (RCC), which interfaces with systems already in place locally or in neighboring countries (for fire-fighters, armed forces, coast guards, etc.). The ground station will detect and locate any distress signal triggered by a ship, plane or land vehicle, thus enhancing the safety of people and goods. The coverage provided by the beam-shaping antenna will allow Togo to receive distress signals over a radius of more than 3,000 kilometers, which means it will cover the entire Gulf of Guinea and a large part of the African continent. Mr.Ninsao Gnofam, the Minister of infrastructures and transports for Togo, stated that the Thales Alenia Space’s MEOLUT Next station perfectly reflects the Togolese government’s aim of guaranteeing maritime safety in the Gulf of Guinea, while also fostering a climate of security that is needed to underpin the economic development of the country and the entire region.